Kolkata: AS many as 11 people have died on being struck by lightning during the rain and thunderstorm that lashed over several districts in Bengal today morning through noon. The state capital Kolkata too got its share of thunderstorm and showers facilitating the much-needed relief from scorching heat. But the squall that surpassed 60 kmph speed led to trees collapsing on several thoroughfares in the city. 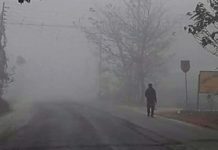 The districts that witnessed the thunderstorm and rain from around 10.30 this morning include Howrah, Hooghly, North 24-Parganas, South 24-Parganas, Nadia, East and West Burdwan, Bankura, Birbhum, Purulia, Jhargram, East and West Midnapore, Murshidabad, Malda, and Cooch Behar. Malda and Purulia districts have received massive hailstones as well. The hailstones are feared to have affected the mango harvest in Malda but a proper assessment will be available only tomorrow. Out of all the 16 districts that have witnessed the thunderstorm, five are counting the toll of the accompanying lightning, which has killed 11 persons so far. One person died at Goghat in Hooghly one, two at Deganga in North 24-Parganas, three each in Nadia and Murshidabad, and two have died in West Midnapore. 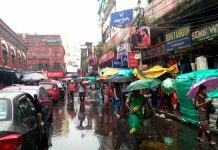 Because of the thunderstorm and rain, the maximum temperature in Kolkata has dropped to 32.1 degree Celsius, which is three notches below normal at this time of the year. Till yesterday, the mercury was doing 37-38 degree Celsius. The Weather Observation Centre at Alipore in Kolkata has forecast more thundershowers in Kolkata and the south Bengal districts tomorrow.